Specifically for animal transportation, our leading-edge stalls and penning are widely regarded as ‘best-in-class’ by our customer base. We pride ourselves on providing effective solutions to difficult logistical challenges, alleviating stress and making the complex industry of live animal transport as simple and straightforward for our customers as possible. Through continued design innovation, our growing range of stalls and penning provides greater flexibility for their occupants. With movable partitions, drop-top and collapsible-top designs that can be tailored specifically to individual needs, and added safety and comfort features, our bespoke in-flight equipment is truly one-of-a-kind. 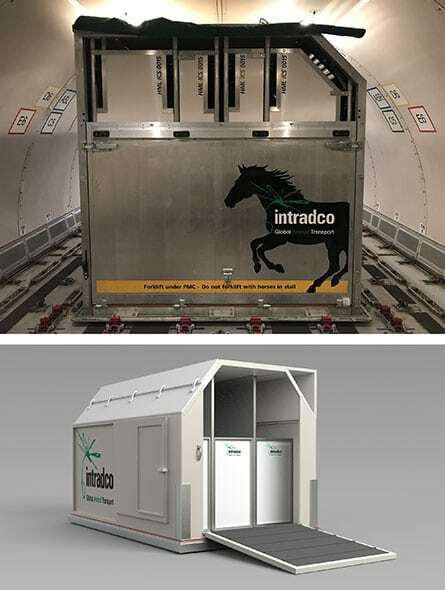 Available for long-term lease or rental, Intradco Global equipment is compatible with Boeing 747 or 777 freighters, McDonnell Douglas MD-11s, Airbus types and other wide-bodied cargo aircraft, making it a favourite with many of the world’s leading airlines. Intradco Global’s collapsible horse stalls are extremely robust and quick to assemble and dismantle - while offering the highest standards of animal welfare. Separate ramps at the front and rear of the stall are used for loading and unloading. 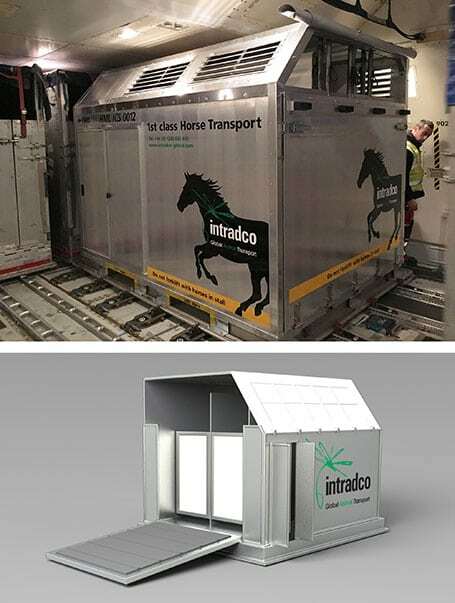 Intradco Global’s design features a flat floor - meaning the horse is not required to step down into position from the ramp. When built the unique design offers ample space for three horses and a safe area for grooms to tend to the animals during the flight. When folded down the stalls are stackable and each stall measures no more than 400mm in height – allowing for cost-effective return shipping. The design of Intradco Global’s fixed horse stalls brings together strength, durability and comfort. In common with the collapsible horse stall design, the fixed stalls offer a safe and easily accessible working environment for the grooms that accompany and take care of the horses while in transit. Displayed here in a regular three-horse configuration, the stalls have movable partitions to allow for two-horse or one-horse arrangements - allowing us to respond to the exact requirements of the customer. Our open-top horse stalls provide occupants with plenty of space with added head room and open-access for the grooms to interact and monitor the horses during the flight. The stalls are fully-collapsible, quick to assemble and dismantle and can be easily stacked and stored for the return flight - allowing for cost-effective return shipping. Intradco Global's loading ramps are extremely robust, durable and quick to assemble and dismantle - while offering the highest standards of animal safety. The ramp features non-slip flooring and raised wooden beading to provide additional support and anti-slip when loading and unloading. In addition to our own ramp systems we also have access to a wide range of designs, sizes and configurations to work with multiple aircraft.